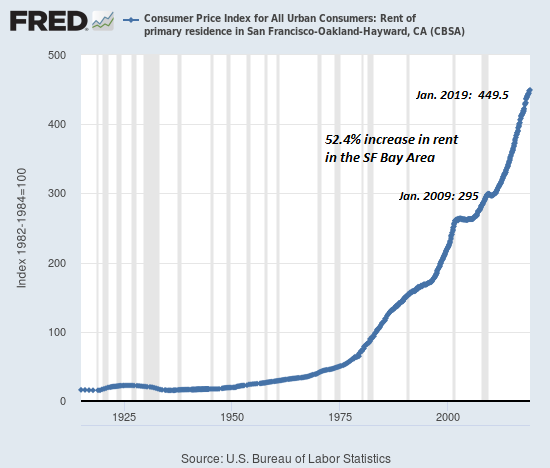 Kathy Lien writes Dollar Soars to 2019 Highs, What’s Behind the Rise? As economic data for 2019 comes in, the numbers continue to suggest more slowing especially in the goods economy. Perhaps what happened during that October-December window was a soft patch. Even if that was the case, we should still expect second and third order effects to follow along from it. 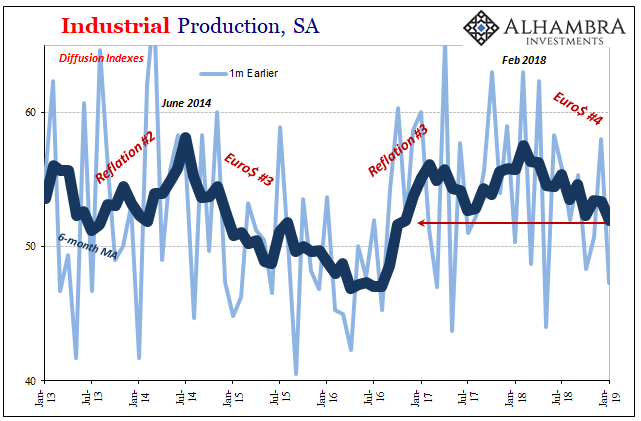 Starting with Europe first, Germany’s deStatis had earlier reported factory orders and production levels in January 2019 while higher than December still keeping within the same trend. These were lower compared to the prior January, meaning a contraction in annual terms that has at least spilled over into this year. 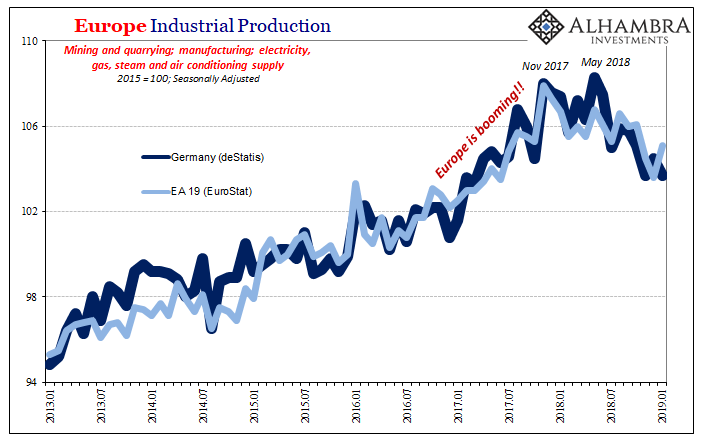 Eurostat’s estimates of Industrial Production for all of Europe, including those collected from Germany and repurposed, unsurprisingly follow the same way. Year-over-year, production in Europe has declined in each of the last three months up to and including January. The rate of contraction is, already, about equal to the worst months of the 2012-13 declared recession. 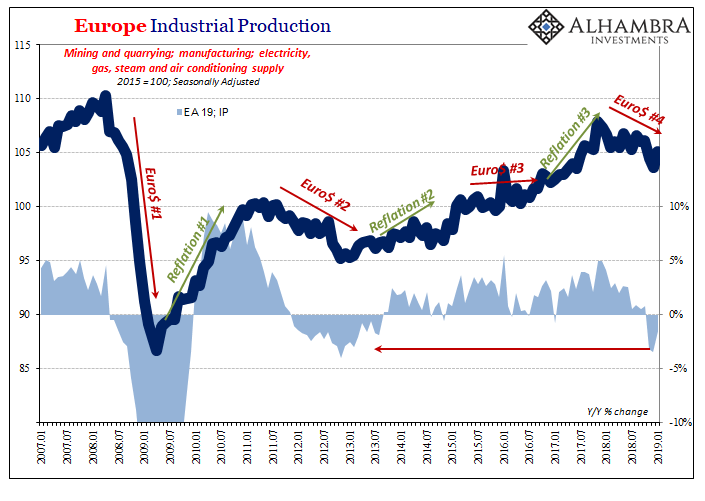 And while Mario Draghi may have still been talking about his booming European economy as late as October, European industry has had it like a recession going as far back as last May if not an earlier inflection all the way back in December 2017. In other words, the word “unexpected” has rematerialized in most commentary but the trend has been in place for a good long while already. Maybe the whole of last year. This simply means it is not something European official should have so easily dismissed, which they will always do, and certainly not something they should take lightly this year. 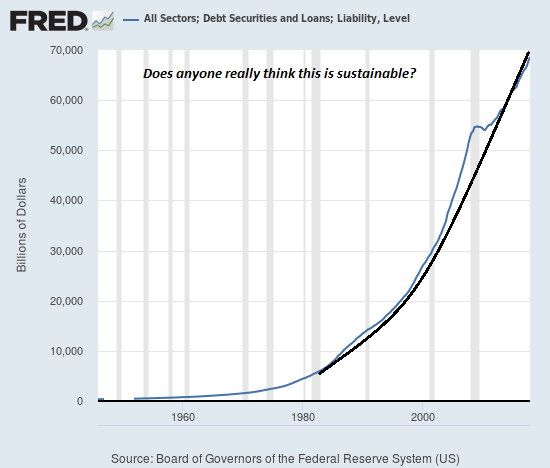 This much time going the wrong way can only be a serious economic concern. Europe’s misfortune was supposed to be just that; European. Of course, that’s not the way these things work. The global economy, tied together by the conditions of a truly global currency, is going to act in harmony in whichever direction it is forced to move. 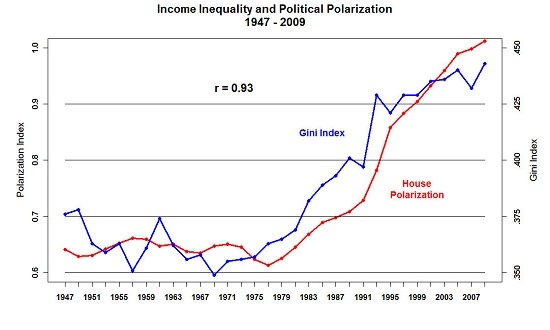 Decoupling was merely a misinterpretation of timing. 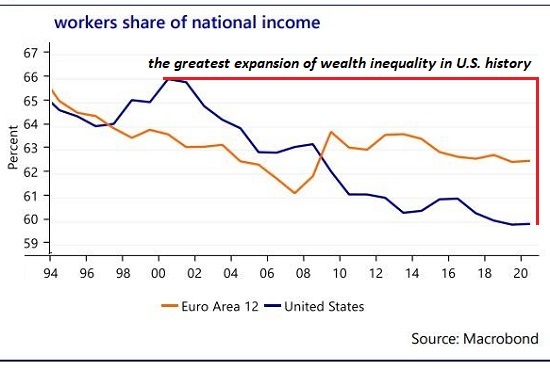 Europe was weak, the US appearing strong. 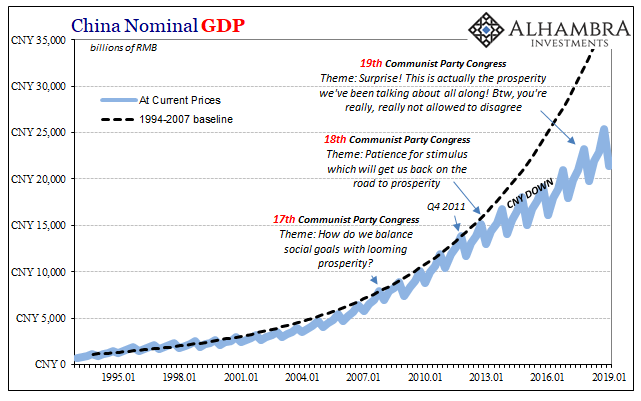 Only, the US economy has been following the same track if from a bit further behind. Part of the reason, a big reason, is simply oil. US domestic energy production continues to drive overall industry. 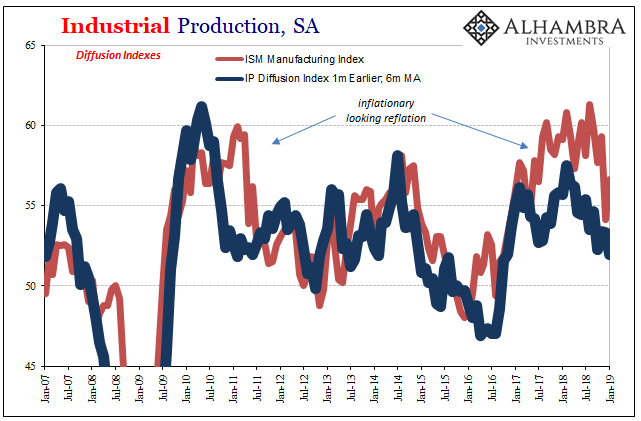 US Industrial Production has only stumbled, overall, in the past few months, first December then January and now in February 2019 according to the latest estimates. That’s three months of slowing compared to at least nine in Germany. Underneath, US manufacturing, of consumer goods in particular, has been much more in line with what we find in Europe (and also China). There has been little to no growth in the American goods sector going back to last May, too. 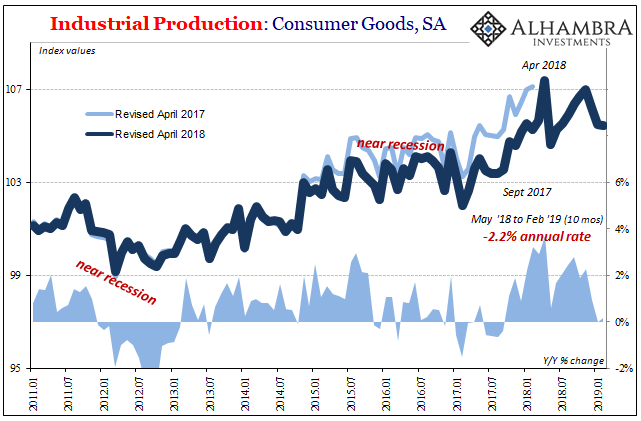 In terms of consumer goods, closer to the weight of the economic slowdown, it is very much like Europe in outright contraction. It’s not just “hard” data, either. The so-called soft data of diffusion indices and various sentiment calculations all show the same thing. It isn’t necessarily a recession that began in the middle of last year, but a definite turn in economic condition away from any upside (however limited). 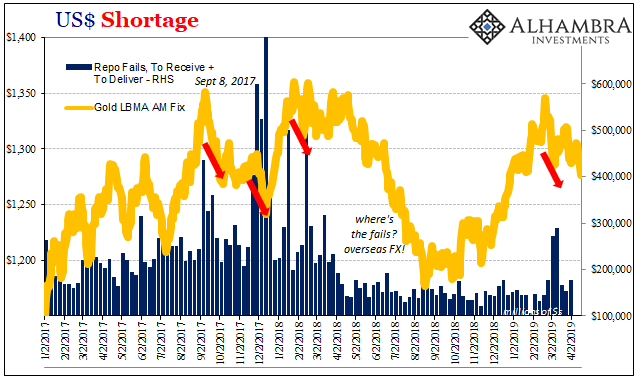 As last time (and the time before), there is an easily discernable inflection point that coincides and correlates with the same indications from around the world as well as clear market events (May 29). 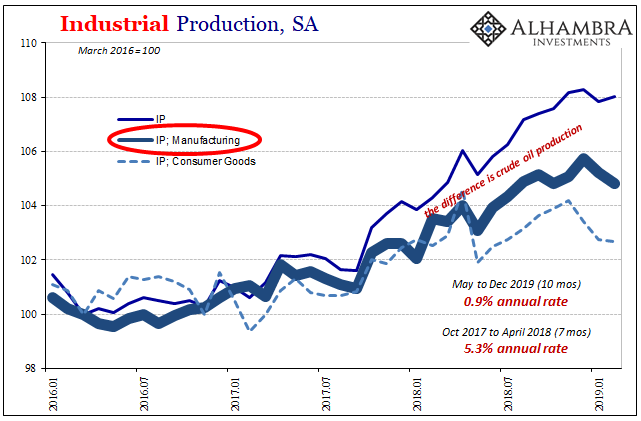 The Federal Reserve, as part of its data on Industrial Production, calculates just such a diffusion index (lagged by one month, meaning the updated diffusion indices are for January 2019). The monthly numbers are volatile and noisy, the average however unmistakable in timing and interpretation. Even the ISM’s PMI for the manufacturing sector has tended to follow, not lead, the Fed’s diffusion numbers. As of January 2019, the 6-month average is now just under 52 which is the lowest since the end of the last downturn in 2016. In short, the entire global system appears to have entered 2019 on a downswing which is still ongoing. The real problem with these is that they don’t turn around so easily. The more the trend becomes entrenched, the longer it continues onward, the less likely it continues to be just a downside risk. Balance of probability, the longer it goes like this the greater the chance these negative factors become self-reinforcing. The old inventory piece of the business cycle isn’t quite dead yet. Companies will hold inventory if sales weaken, and cut back production orders while they do, but only to a certain point. 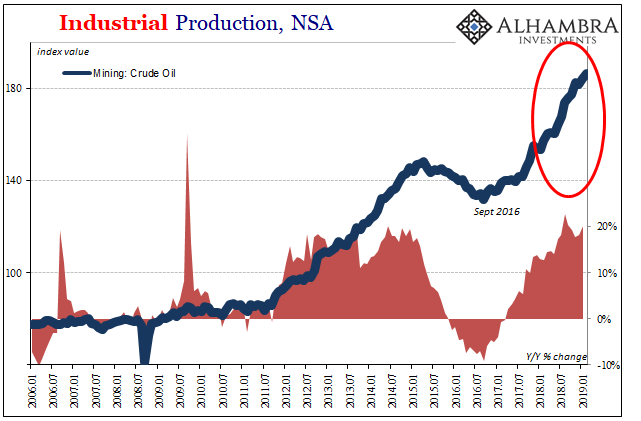 Past some unknowable threshold, the inventory gets liquidated, production orders the entire supply chain collapsed and that’s what used to equal recession (once production stoppages became work stoppages, too). Buchanan: Is Diversity A Root Cause Of Dual Loyalty?